Walmart To GOP Senator: Give Us Back Our Money - Joe.My.God. 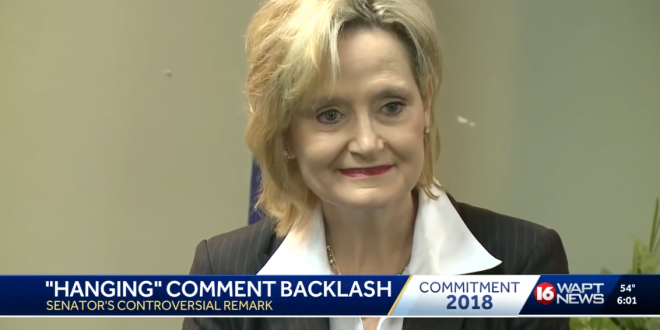 Walmart is ending its financial support for Sen. Cindy Hyde-Smith (R-Miss.) after video surfaced earlier this month of the senator saying she’d be in the “front row” of a “public hanging” if invited. Walmart’s statement came in response to a tweet from actress Debra Messing who posted an article from Popular Information, which reported that the retail giant contributed $2,000 to Hyde-Smith’s campaign on Nov. 18, about a week after Hyde-Smith’s comments became public. Walmart said it is also asking for Hyde-Smith, who is facing Democrat Mike Espy in a close runoff election on Nov. 27, to return its donation. Previous Chuck Schumer Demands DOJ Probe: Did Acting AG Matt Whitaker Share Mueller Info With White House?